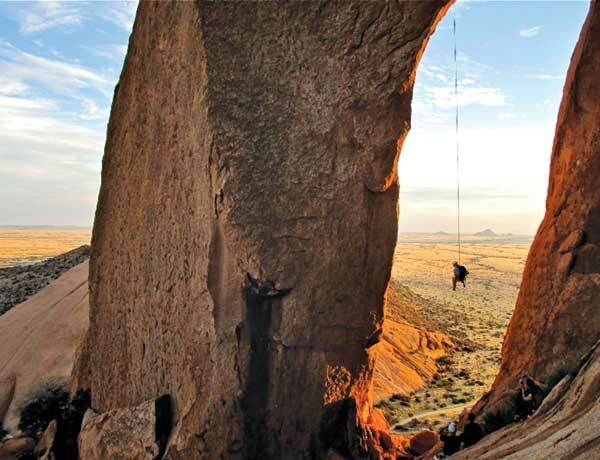 T he Spitzkoppe is a group of rounded granite mountains situated north-west of Usakos, en route to Swakopmund. A favourite with climbers, the Spitzkoppe peak – affectionately known as Namibia’s Matterhorn because of its resemblance to the famous Swiss mountain – was first climbed in 1946. The Spitzkoppe group peaks at 1 728 metres above sea level. Seventy metres above the surrounding gravel plains are Sugarloaf Mountain and the Pondok Mountains (resembling the rounded Damara huts called pondoks). 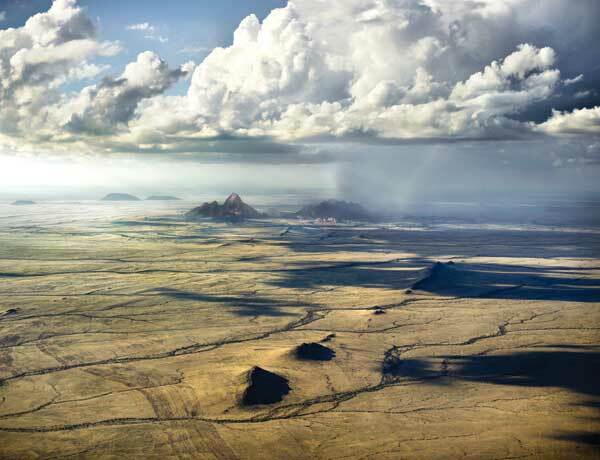 Rising 600 metres above the Kaokoveld plains, the main inselberg (island mountain) of the Spitzkoppe is approximately 700 million years old. After good summer rains, tall grass blows across the plains and small pools of water collect on the granite rocks of the mountain in shallow hollows. The group also has a minor peak, Little Spitzkoppe, which extends into the Pondok Mountains. On the eastern side is Bushman’s Paradise, with a walk up the steep incline made possible by the use of a fixed steel cable. Remains of San/Bushman paintings can be seen in the overhang. Unfortunately they, like most rock art in the Spitzkoppe area, have been vandalised. Other rock paintings can be seen at the Small Bushman’s Paradise and Golden Snake sites. At the Spitzkoppe turn-off, where the D1918 meets the B2, is the popular Ûiba-Ôas Crystal Market. Here the local community sells a variety of crystals, gemstones and minerals. The market is open seven days a week.